Thai panang chicken curry (also spelled penang like the northern Malaysian state) features a warm, rich red curry with flavor notes from Malaysia, Burma, and India. Don't be put off by the long list of ingredients in the Thai panang sauce. All of them require little to no preparation and are simply tossed in a food processor or chopper and easily blitzed. But without those ingredients, your dish will lack the rich, complex flavor it was meant to have. Traditionally, this curry would be simmered on a stovetop or over a wood fire. For ease of preparation, this recipe gives directions for oven cooking, but it can be simmered on a stove top if desired, being sure to cover it and stir occasionally until cooked. 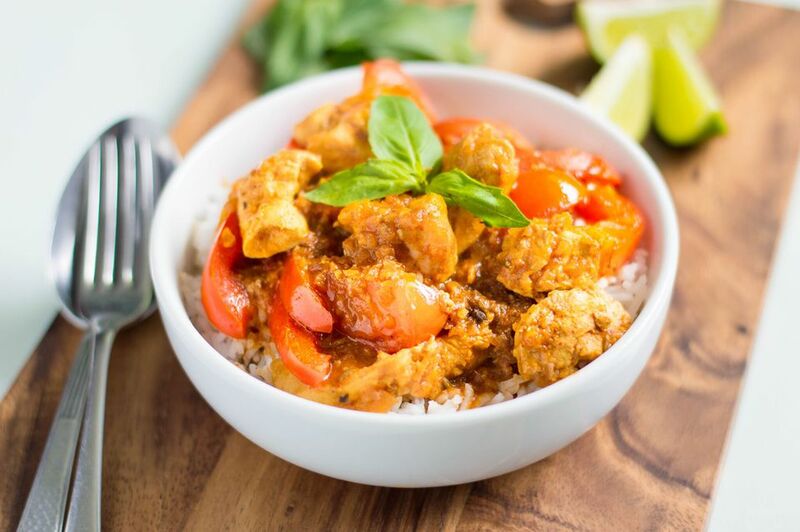 Note: while there are multiple steps to this recipe, this Thai Panang chicken curry is broken down into workable categories to help you better plan for cooking. To a food processor work bowl or blender, add tomato paste, quartered onion, galangal or ginger, garlic, soy sauce, dark soy sauce, fish sauce, shrimp paste, paprika, chili powder, coriander, chiles or cayenne pepper, turmeric cinnamon, nutmeg, cloves, coconut milk, and lime juice. Process well. Pour sauce into a casserole dish. If you'd like more sauce, add up to 1/2 cup good-tasting chicken stock and stir together. Add the chicken pieces to the casserole dish along with the cumin seed and lime leaves or bay leaves. Mix well. Cover casserole dish and bake for 45 minutes. Remove from oven and add the tomatoes and peppers. Stir well, then return to oven to bake another 15 to 20 minutes, or until both chicken and vegetables are cooked. Taste test and then sprinkle with fresh basil leaves and serve with plenty of Thai jasmine rice (white or whole-grain). When doing your taste test, add more fish sauce if not salty enough. Add more coconut milk or a little yogurt if it is too spicy. If it's too salty, add more lime juice.